>Hiking in Pacific Rim National Park: Here is more from our B.C. trip in 2010. This article slipped through the cracks, but here it is! From the rainforest to the ocean, clients can explore the interpretive trails of Pacific Rim National Park nestled along the southwest coast of Vancouver Island and backed by the Vancouver Island Mountain Range. 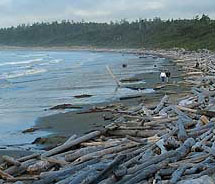 With a rugged coastline and a temperate rainforest, the park is spread over 197 square miles on a thin strip of coastline near Tofino, B.C., and made up of three major areas: Long Beach, the Broken Group Islands, an archipelago of more than 100 islands accessible by boat, and the West Coast Trail. Read more about our trip to Pacific Rim National Park.